Victory fairings bolt on the factory clamp windshield brackets. See pictures on website. Factory windshield brackets can be adjustable, slide them up or down with the Victory Round Headlight. Victory Part # 2874426 (43 mm forks) factory clamp windshield brackets. Victory Part # 2874679 (55 mm forks) factory clamp windshield brackets (Inverted forks), some Hammer's and 8-Ball models. Memphis Shade brackets & Lock & Ride windshield brackets will not work. 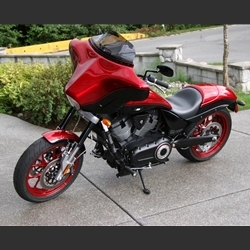 Lowering the speedometer ¾” and laying the fairing back will create a more sporty look. See instructions on installation guides. You don't have to lower your speedometer to make this fairing work. You can purchase factory windshield brackets at the following websites or your local Victory Dealer.